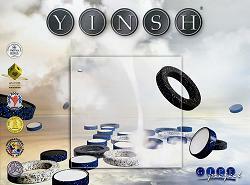 Yinsh is a two player game where the players start with 5 rings on the board. Every time a ring is moved, it leaves a marker behind. Markers are white on one side and black on the other. When markers are jumped over by a ring they must be flipped, so their colour is constantly changing. The players must try to form a row of 5 markers with their own colour face up. If a player succeeds in doing so, he removes one of his rings as an indication that he has formed such a row. The first player to remove 3 of his rings wins the game. In other words, each row you make brings you closer to victory - but also makes you weaker, because you have one less rings to play with.